People in the United States depend on Facebook as a vital tool for living their lives. Now, it has become apparent that millions of people’s Facebook data was exploited by Cambridge Analytica for political gain. Users of the Facebook platform shouldn’t be subjected to surveillance and invasion of privacy. Show us your commitment to acting reasonably and lawfully, and ensuring that your company will not continue to violate our trust. Please deliver the transparency that Facebook users deserve: Agree to testify under oath before Congress. The scandal at Cambridge Analytica has exposed how our personal information is being collected and sold to third parties, which exploit our “likes” for political gain.1 Millions of people are asking themselves and leaders in Washington the same question: What are we going to do about Facebook? First, we need answers. Starting at the top. It’s time for Mark Zuckerberg to testify under oath. Facebook is trying to paper over this crisis with PR spin and vague promises of being “open” to testify, but we’re well beyond that. We need Zuckerberg to provide answers before Congress. These platforms have enabled a generation of people of color and others within marginalized communities to transcend systemic bias and barriers — to determine their own destinies. Depending on Facebook and other platforms shouldn’t mean by definition that you’re subject to surveillance and manipulation. We demand that Facebook protect our privacy. It’s time for Mark Zuckerberg to show up in Washington with complete transparency and begin a long-overdue conversation on how internet platforms profit from our personal information. We need to hold Zuckerberg accountable for Facebook’s failure to safeguard our digital lives. We deserve answers. 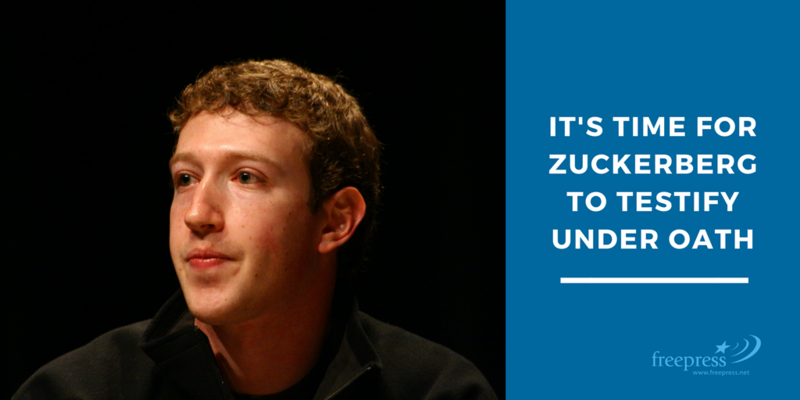 Tell Mark Zuckerberg to come clean before Congress.